PitSweeper 2 is going to be the first sequel to a game that I’ve made, and I’m aiming to make it my most complete and polished one as well. I’ve made a few games so far, and I feel that while I like to make games with interesting ideas, I don’t polish them as thoroughly as I could. With PitSweeper 2 though, I’m going to focus on execution and refinement; the fact that it’s a sequel helps. My goal is to make this my first game to get a sponsorship before release, and so far I feel I’m going to do it. A larger and non-square playing field, that makes it possible to have level layouts that are less abstract and feel more like a place you’d find on a map. The levels also have more visual detail like floor textures, and extra features like keys and doors, to give the levels a stronger sense of place. More ambiguous sweeping. When I designed the first game, I wanted there to be more of a balance between sweeping and adventuring, and moments where you had to go through tense guessing games to avoid danger. However, I found that instead, it was possible to just surgically sweep, extracting treasures, avoiding monsters, and treating the game more like pure puzzle than a puzzle/adventure hybrid. So I’ve replaced the numbers with codes instead, that only tell the player if one thing or many things are nearby – to help encourage the adventuring side of the game. Not only that, but I’ve expanded the altars and vending machines of the first game into their own class of objects called ‘Landmarks’. Landmarks automatically turn the sweeping marks yellow (the same as if there were both monsters and treasures nearby), making pure sweeping more difficult. Uncovered monsters will ram tiles in order to get to the player, sometimes breaking them in the process – encouraging the player to sweep nearby themselves instead of testing far-off pockets of the map before moving. Stats have been simplified. I’ve swapped out the D&D style dice notation for weapon damage and replaced it with simple ranges; I’ve also made the rules for how Speed and Power affect combat more straightforward. I’m using Flixel instead of flash.display as my display engine. The game is using mainly bitmap and sprite graphics instead of mainly vector, and the overall look is much cleaner and crisper. Not shown on the screenshot is a new Mana stat. As you sweep, you build up magic points, which you can cash in for various sweeping effects – for instance, remove all the squares next to a green mark, or reveal all the wall squares on a level. Finally, PitSweeper 2 is going to have a proper story mode – with multiple dungeons, checkpoints, and cutscenes. Sweeper is an innocent yellow ball in an otherwise dark world – and his ability to sweep and sense also gives him the ability to connect with some awfully powerful figures..
That’s all for now. Next progress report will probably focus on the story and background of the game. This entry was posted in Uncategorized and tagged flash, game, gaming, minesweeper, pitsweeper, programming, progress, Projects, roguelike, rpg, sequel, wip. Bookmark the permalink. Dude.. Hope this finishes out.. I’m stoked.. I wish I could get a list of all the items in game on sweeper 1, and like a community for the game. I really enjoyed the first one, I played with friends competing to see who could win first. Really looking forward to seeing this sequel! I wish you the best, hope you finish this game one day. i really liked the first one. i hope you make the second! A scrolling space shooter. Your odds were bad enough against the enemy forces, but they've mastered a strange technology called 'auras' - particle fields that can bend or reshape bullets in midflight. Poor little Sweeper has to make his way to the bottom of the Tyrant's Pit, using whatever equipment he can find along the way - and his valuable skill of "sweeping". 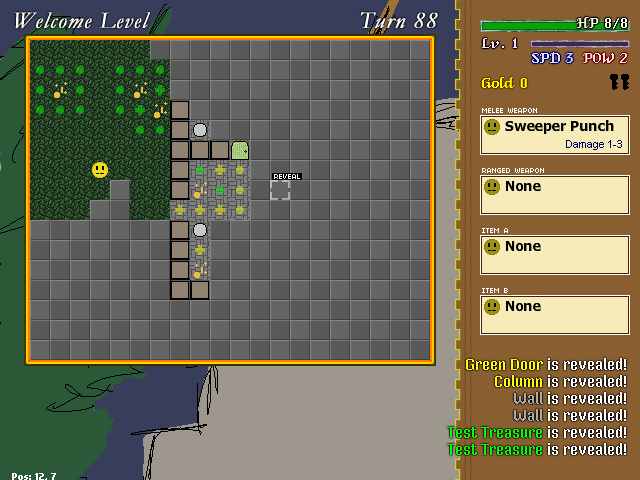 A cross between Minesweeper and a Roguelike game. An abstract matching puzzle game, that starts out simple, and turns gradually more active as you gain additional rules and powers, and a higher quota to make. CotG Desktop is an AIR application I wrote that was a playing assistant for the pro-wrestling card game, "Champions of the Galaxy", from Filsinger Games. It was designed to streamline and automate gameplay for the card-and-dice game. This is the AS3 port of the scripting engine, ported from the original AS2 version at be-interactive.org.